Link: Melbourne Playgrounds - Your guide to fun things for kids to do in Melbourne! 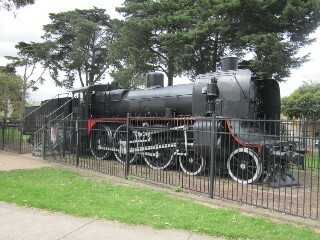 "Has a full size A2 class locomotive on display. The train is fenced off but it is possible to enter the driver's compartment and pretend that you are driving Douglas (or at least have a good healthy discussion as to which train it is from Sodor). The playground near the Athletics track and train is poor with broken down, old equipment. There is only one swing without a safety chain. Plenty of BBQs with sheltered tables. Near lake with lots of waterbirds. Toilets when they are not closed for repair - are they waiting for the Queen to visit for a grand re-opening ceremony?" I wonder what a one star park is like.